The 8Sinn GH5/GH5S Cage + Top Handle Basic is a CNC Machined, anodized aluminum full-armored cage with integrated accessory mounting holes and an orientable top handle system. 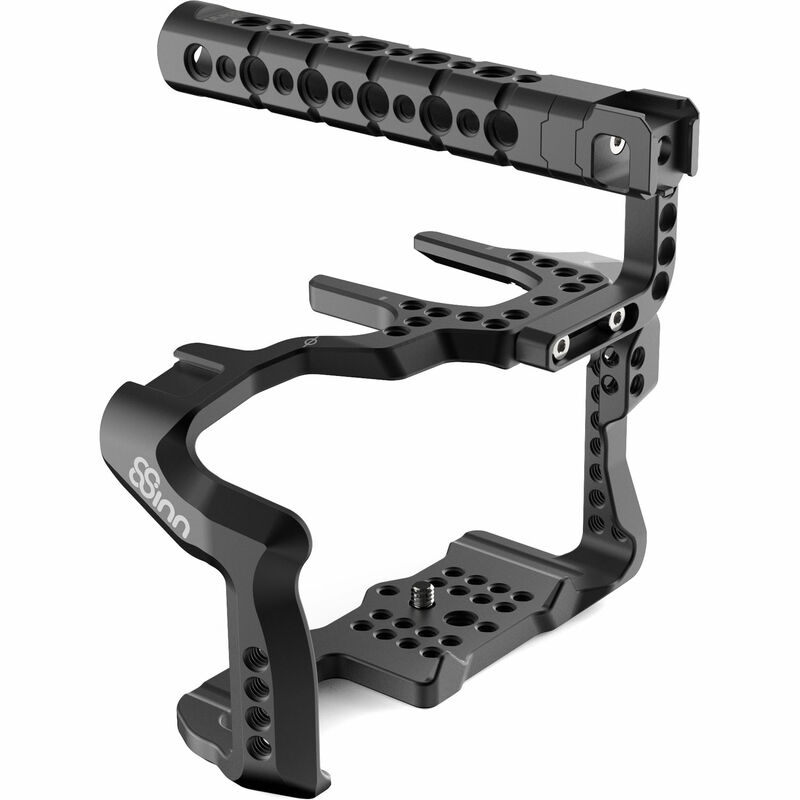 The cage prevents your camera from twisting once mounted and features an integrated cold shoe mount and slots for a carry strap (not included), as well as 1/4"-20, 3/8"-16, and M4 threaded mounting holes that allow you to mount accessories without stressing your camera's body. The top handle attaches with two cap-head screws that hold it secure, and it can be mounted either forward or rear facing. It features two cold shoe mounts and both 1/4"-20 and 3/8"-16 threaded mounting holes. The design of the cage offers two small raised tabs that hold the camera in place and prevent it from twisting. Access to all camera functions, battery, and media doors is maintained. The formfitting cage incorporates front tabs that prevent the camera from twisting in the cage. The cage features a variety of 1/4"-20, 3/8"-16, and M4 threaded accessory mounting holes. This allows you to mount accessories without stressing your camera's body. The top handle features both a top- and forward-mounted cold shoe mount. It also features 1/4"-20 and 3/8"-16 threaded mounting holes. The optional Audio XLR unit for the GH5 can work with the cage, but will require the addition of an optional extension adapter when using the cage and top handle together. Box Dimensions (LxWxH) 9.2 x 5.8 x 3.1"
GH5/GH5S Cage + Top Handle Basic is rated 3.0 out of 5 by 2. Rated 5 out of 5 by Darek from Great cage! I just love it ! The right side grip is slim so it feels very comfortable in the hand. I don't know why someone wrote that it blocks the remote port as I use the cage and my camera together with remote cable and I haven't noticed any toubles with using the whole set. The cage has special space that provides access to remote cable. Rated 1 out of 5 by Takeshi from This cage is the worst. This cage blocks the remote terminal.